Ali Emre Karadeniz was born in 1976, Edinburgh, Scotland. He has dual nationality in Britain and Turkey and he is fluent in both languages. 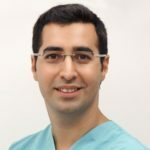 He received his medical degree at Istanbul University, Turkey in 2000 and went on to specialize in the field of plastic reconstructive and aesthetic surgery, which he completed in 2007. His most important hobby during his junior years was playing chess where he won most of the national competitions he participated in. He represented his country in numerous international competitions including two world chess Olympiads. After completing government and military service in 2010 he started working in hair restoration surgery at Transmed Hair Clinic, until 2013. Due to his enthusiasm and dedication to hair restoration surgery he performed 1000 hair operations in a relatively short period of time, which also lead to active participation in scientific meetings. In 2013 he was invited to talk in three scientific meetings; the International Society of Hair Restoration Surgeons, San Francisco, Turkish Society of Plastic, Reconstructive and Aesthetic Surgeons, Istanbul and ICAAM – middle east Aesthetic Surgery Congress in Dubai. In order to provide a very high standard of surgical treatments he founded AEK Hair Institute in 2014, where he performs all of the surgical procedures himself.